With its year-round tropical climate, Honolulu offers gardeners many opportunities to grow tropical fruit trees, many vegetables and exotic ornamentals. Oahu, the island on which Honolulu is located, is one of the older Hawaiian Islands. Its soil has had thousands of years to form, unlike the Big Island, which remains solid lava rock in many places. Many plants have found their way to Honolulu; some have been there since ancient times while others are more recent additions. The Hawaiian archipelago is still forming. All of the islands are the result of volcanic activity, which continues to actively occur on the most southerly of the chain, Hawaii Island, or the “Big” Island." A “hot spot” continues to exist on the ocean floor. This hot spot has created the entire island chain over thousands of years, and as the land masses naturally migrate northward, the hot spot remains stationary. It is now creating a new island called Loihi, southeast of the Big Island. It takes many thousands of years for an island to form, and thousands of years more before the lava rock that it is made of to break down and form soil and sand. Hawaii’s soils have been mapped and studied twice since World War II. Ten types of soil exist in the world, and Hawaii is the only state to contain all of them. 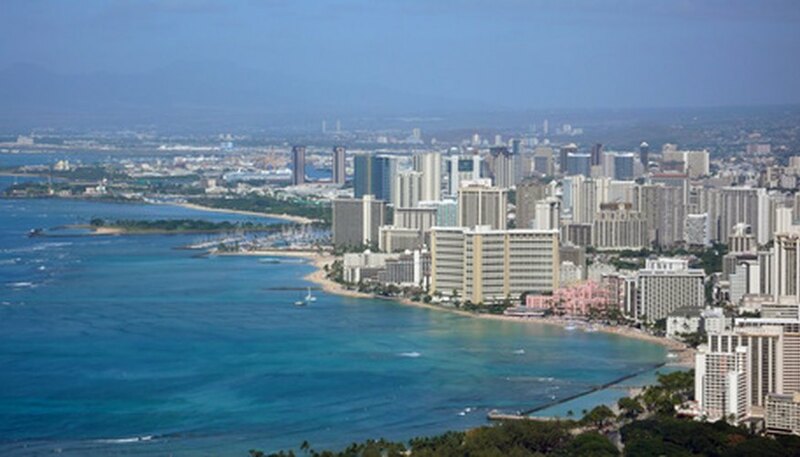 Because Honolulu is a coastal city, its soil is predominantly sandy and is known as aridisol. This soil type is common in dry regions, according to the University of Hawaii. It comes from pumice, ash and cinder that originate from volcanic activity. Organic materials also exist in aridisol, making it loamy and productive. Other parts of Honolulu have two other soil types: inceptisols and histosols. Inceptisols include soil that sits on top of volcanic ash; histosols, usually about 2-to-8 inches deep,are organic soils that exist on lava flows that are old enough to have developed forests. Hawaii is known as the “endangered plant capital” of the world because many of its native plants are either threatened or already extinct. Some people intentionally grow native Hawaiian plants in Honolulu, such as the state flower, the mao hau hele yellow hibiscus (Hibiscus brackenridgei), but few undeveloped areas exist within the city limits. Even in the wild mountainous regions near Honolulu, few native Hawaiian plants remain. Conservation efforts are under way to educate the population about the importance of growing native plants in their gardens as a means of keeping them from further threat. The fragrant, flowering plumeria tree is common in all parts of Honolulu. Other attractive introduced ornamentals are also seen in this city: They include bougainvillea, orchids of many varieties, hybrid hibiscus, wiliwili, dieffenbachia, philodendron, anthurium, flowering ginger, gardenia, jasmine, crape myrtle, shrimp plant and lantana. Residents plant many types of palm trees for their graceful, swaying fronds and shade and their ability to grow with little need of human help. Even the ubiquitous coconut palm is not native to Hawaii, although it has spread widely because of intentional planting and the fact that coconuts sprout and grow into trees wherever they fall. Although stone fruits such as peaches do not do well in Honolulu and other areas that are without a period of winter chill, many tropical fruits are present in home gardens. They include, but are not limited to Jack fruit, sapote, guava, mango, papaya, date palm and pineapple. Residents also grow vegetable gardens, which often contain Asian vegetables such as Japanese eggplant, bok choy and Chinese cabbage. Tomatoes do well in Honolulu, as do cucumbers, green beans and other typical vegetables. However, the high humidity and plentiful fruit flies often make a screen house necessary for these vegetables to grow to fruition. What Plants Are Native to the Dry Tortugas?